There’s nothing more frustrating than making a nice, well-balanced dinner and then having our child refuse to touch it. We threaten, we plead, and we end up giving them a bowl of cereal an hour later because, well, it’s an exhausting battle. But there are a few things you can do to help your child try, and learn to like, new foods. 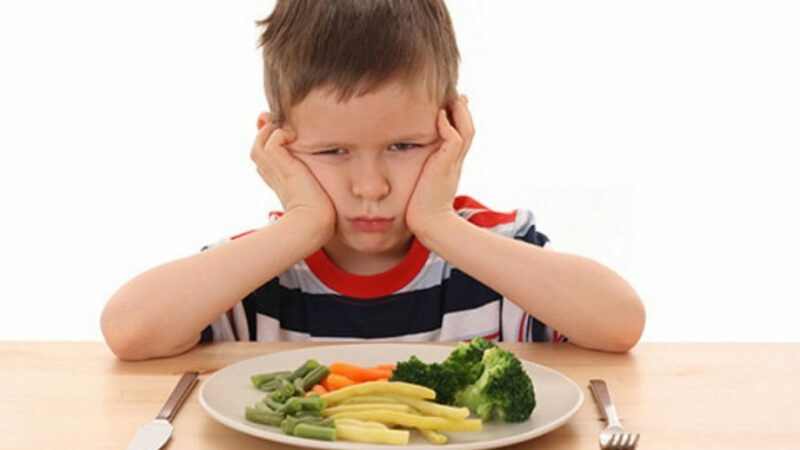 Picky eating is very normal for young children, and almost every child will go through phases starting around age two where they just want to eat the same things over and over (and over!) again. So how do we establish healthy habits when our kids refuse to eat the healthy food we prepare? And how do we keep our frustration at bay while we’re working on it? First of all, there are some important boundaries to set about mealtime before you even try to introduce anything new. And, of course, introducing a child to healthy foods as early as possible – and avoiding giving them sugary treats – will help them to develop good habits. Make sure you follow a routine for meals and snack times. Little ones who learn that they can have a snack an hour after they refuse dinner – even if the snack is healthy – are going to learn they don’t have to eat what’s on their plate. Toddlers and preschoolers will often only eat a few bites in one sitting before they’re full. Our “supersized” American portions are unhealthy, and we shouldn’t judge the quantity of food a young child eats on our misconceptions of portion size. Offer age-appropriate portion sizes and introduce them to new foods a few bites at a time. Allow little ones to experiment and explore, and follow Mommy Underground’s great tips for helping them to learn and grow with all the colors and textures that make mealtime enjoyable! If your child refuses to eat certain foods, try combining them in creative ways with foods they like — and keep exposing them to it. Make it known that foods they refuse are not going to permanently disappear just because they don’t like them. Kids love it when we make food fun. If your child doesn’t like to eat fruits or vegetables, try to cut them into fun shapes with cookie cutters or even create an animal or creature out of different kinds. Experiment with making healthy food more appetizing while young kids are learning to like it,for example, adding a bit of shredded cheese to broccoli or even mixing cooked spinach into their old stand-by, macaroni and cheese. Pizza is another great way to introduce veggies. Think outside the box and add lots of healthy colorful vegetables on top. They can even help make it themselves, designing a fun pattern or face! Kids are more apt to try new foods when they have a hand in helping to prepare it. Their sense of pride in their accomplishment should help them overcome not trying their creation. Try some other great ideas for fun and healthy snacks from Mommy Underground here. Variety and repeated exposure are key to teaching young children to try new things and stick with them. Remember that as kids grow, their appetites may change. They may eat less at certain ages and then more when they are approaching a growth spurt. Don’t compare your child to other children their age, or even their siblings at the same ages. Every child is different. Be careful not to treat picky eating or refusal to eat a certain food as a behavioral issue. If you threaten, bribe, or get angry because your child won’t eat what you have prepared, it will only serve to make picky eating worse. Getting too involved in children’s eating is tricky territory. Studies show that pressure to eat may lead to reduced appetite, disinterest in food and more pickiness. Bribing with dessert may get kids to taste a food, but their food preferences may shift to liking dessert more, not veggies. Always make sure not to take away a privilege like television or a toy over a food issue. They are not related to each other and will affect your child’s relationship with food. These types of reactions lead to emotional eating and even eating disorders later in life. Stay calm and positive to encourage them! And as with everything else, we as parents must model healthy eating habits – not just eating healthy foods, but eating until full, not overindulging in treats, and not eating for emotional reasons. Food nourishes our bodies and minds. We associate it with special moments, use it to connect with each other around the table, and make memories with our cooking. We learn all of this in childhood, and by example. So make eating a calm, healthy, and enjoyable experience the entire family can share. They’ll be eating that broccoli in no time! What are some of your tried-and-true tips for picky eaters or getting your child to like new foods? Leave us your tips!